Do you want to Check the Status of your Aadhaar Complaint? Then you are in the right place. After Filing a complain the next thing is to check its Status to know whether your complaint is taken into action or not. But there is a Good news and Bad news. Good news is that Checking the status of your Aadhaar Complaint is very easy and YOU can do in a couple of minutes. The Bad News is that UIDAI doesn’t have any direct method to visit the page so it’s quite tricky. But don’t worry I got you, just follow me Step by Step. Today I will share How You Can Check the Status of your Aadhaar Complaint Easily. 2. 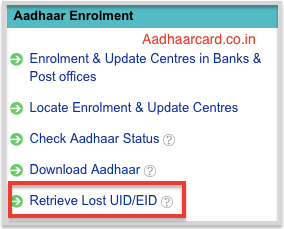 Click on Retrieve Lost UID/EID which will redirect you to another Page. 3. From the Menu Bar click on Grievance Center which will be on the Right end. 4. Under the Complaint Status Summary, Click on Check Complaint Status. 5. Enter your Complaint ID and Security Code in their Feilds and click Check Status. P.S. – Complaint ID is the ID given to you after you Raised a Complaint. So Today I shared How you can Check the Status of Aadhaar Complaint Easily. If you like this article then do share it with your friends and family.